Francesca Schiavone has not won a match since claiming the French Open title earlier this month. 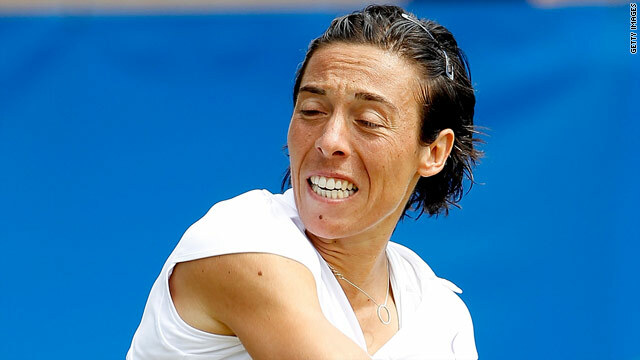 (CNN) -- French Open champion Francesca Schiavone crashed out of Wimbledon in the first round after losing in three sets to unseeded Russian Vera Dushevina. Schiavone of Italy, seeded fifth at the All England Club, went down 6-7 7-5 6-1 to a player who has never been beyond the second round at Wimbledon. It was Schiavone's second straight first round exit since the capture of her first grand slam title at Roland Garros earlier in June. Dushevina, ranked 56, lost the first set but grew in confidence as the match went on, racing into a 5-0 lead in the decider and clinching the victory in two hours, 54 minutes. "It was a tough match on a different surface with a different feeling," Schiavone told reporters. "But she played very well and I didn't take my chance in the second set." Who can stop Williams sisters? Elsewhere, Kim Clijsters thrashed unseeded Italian Maria Elena Camerin 6-0 6-3 in her first appearance at Wimbledon since 2006. Clijsters of Belgium, who came out of retirement in 2009, wrapped up the first set in just 24 minutes on Court Two. And although the Italian fought hard in the second, the eighth seed did not face a single break point as she won in 65 minutes. Clijsters will next face Croatia's Karolina Sprem, who beat American qualifier Bethanie Mattek-Sands 6-3 6-4. Meanwhile, five-time champion Venus Williams cruised into the second round with a 6-3 6-2 win over Paraguay's Rossana De Los Rios. "It's good to be back. I love playing on the grass," Williams said. "It was pretty straightforward out there but it's just the first round and I'll try to play better with each match." In other results, Justine Henin of Belgium beat Latvia's Anastasija Sevastova 6-4 6-3, Marion Bartoli of France, the 2007 finalist, beat Julia Goerges 6-4 6-3 and there were wins for Russians Nadia Petrova, Vera Zvonareva and Maria Kirilenko. It was a disappointing day for the home nation with British women Laura Robson, Elena Baltacha and Melanie South all beaten on day one. Robson went down 6-3 7-6 to fourth seed Jelena Jankovic of Serbia, Baltacha lost to Croatia's Petra Martic in three sets 2-6 7-5 6-3 and wildcard South was beaten 6-1 6-2 by Regina Kulikova of Russia.